30th Indiana At Rest is an attempt to locate, photograph and document the final resting places of the soldiers of the 30th Indiana Volunteer Infantry. 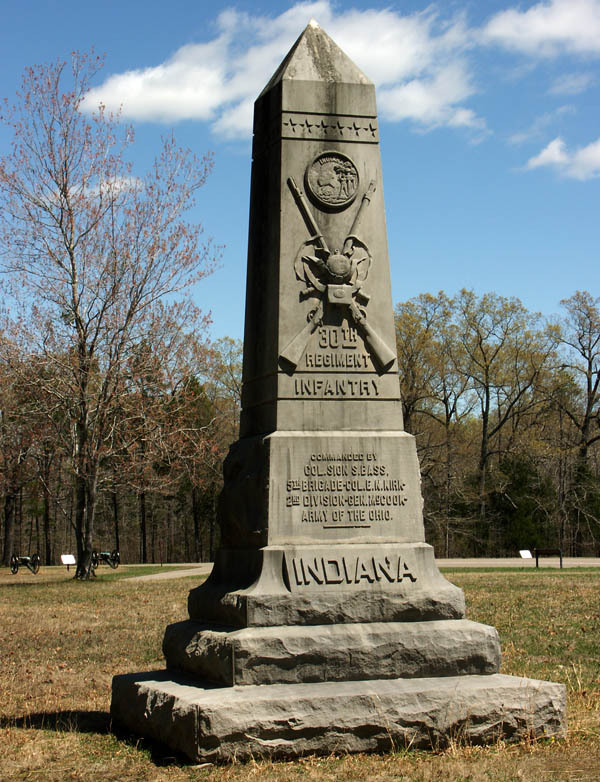 The 30th was active from 24 September 1861 to 25 November 1865 and was based at Camp Allen in Fort Wayne, Allen County, Indiana. I unknowingly started this project in 2005 while in a cemetery doing genealogy research when I took a couple of pictures of gravestones of members of the 30th Indiana because my son was a member with the 30th Indiana Civil War Re-enactors. As of 28 July 2007, I have located about 225 burial location and photographed about 100 grave markers in Indiana, Michigan, Mississippi, Tennessee, Iowa, and Illinois. I am creating a database to display the photos and will post them when I complete that work. If anyone happens to visit this site and knows the burial location of a 30th Indiana soldier, please email me at brad@30thIndianaAtRest.com.